Microba, an Australian company in microbiome science and testing, has partnered with Macrogen to develop new microbiome services in offshore markets. 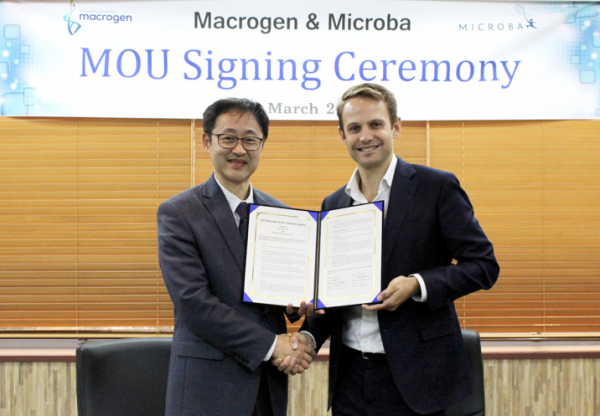 An MOU outlining the partnership was recently signed at Macrogen Headquarters in Seoul. Macrogen is a significant Korean listed biotechnology company with a market capitalisation over US$350 million and annual revenues over US$100 million. Microba is a microbial genomics company with a unique technology platform using shotgun metagenomic sequencing to accurately characterise the millions of microorganisms that inhabit the large intestine, collectively known as the gut microbiome. The technology platform was developed at the University of Queensland by Professor Philip Hugenholtz and Professor Gene Tyson. It is expected the two companies will build a global database of high-resolution gut microbiome data that will contribute to the development of new diagnostic methods and treatments. “Microba is a company with world-leading technology in the microbiome field, which is one of the fastest growing industries,” said Kap-Seok Yang, CEO of Macrogen.